Leilani Farm Sanctuary, home to nearly two hundred rescued animals, is unique among farm sanctuaries in that the animals co-exist in the same environment, rather than being separated by species. 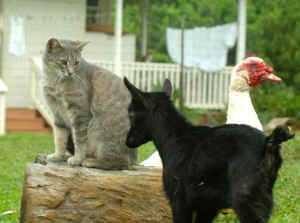 Donkeys, goats, pigs, and deer graze in the fruit orchard, intermingling with chickens and cats. 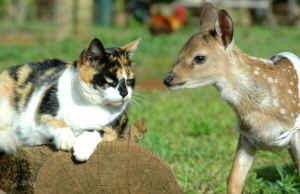 It is delightful to see animals of different species co-existing harmoniously and forming special bonds. 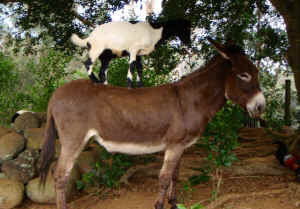 As a young goat, Danny discovered the fun of jumping on the back of Lehua the donkey. Several times a day, he went for rides around the farm on her back. Lehua seemed to enjoy the experience just as much as Danny did. Susan, a rescued rabbit, has become best friends with a pair of dessert tortoises. After Susan’s mate died of old age, we tired to introduce her to new rabbit friends, but she fought with each one. Now she seems most content in the company of her tortoise and chicken friends. Our pig, Kea, who was brought to the Sanctuary after escaping from a pig factory, became especially fond of one of our donkeys and soon began standing on her hind legs in order to reach up to the donkey and give affection. 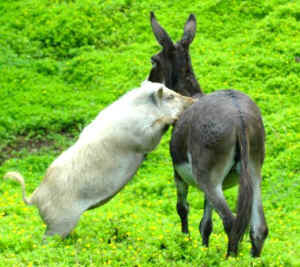 This ritual continued until Kea became too heavy for the donkey to support her weight. 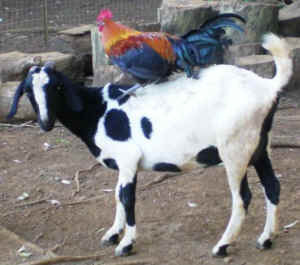 Richard the rooster flies up onto the back of Betty the goat each evening before sunset, and stays with her until bedtime. 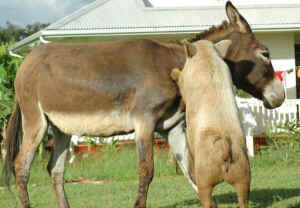 The two unlikely friends seem to bring each other comfort. Our goal at Leilani Farm Sanctuary is to give visitors the opportunity to witness the animals’ endearing antics, and to see them as individuals with personalities. It is our hope that people will open their hearts and minds to regarding farm animals not as food, but as beings worthy of love and protection. At the end of each Sanctuary tour, we provide our guests with vegan starter kits to help them embark upon on the path of compassionate vegan living.